a456’s recent post on samarra reminded me of the perils of urbanism from above. this is a doubly well-timed post… first, because i’ve recently been looking for several ancient cities through google earth. some of my favorites: fatehpur sikri [india], balkh [afghanistan], persepolis [iran], and misrian [turkmenistan- just because it was so hard to find]. nearer to my neighborhood, google earth has some nice views of sacsayhuaman, pisac, and the better known machu picchu [all in peru]. bonus: zoom back to see the road to machu picchu- the rectangle between the road and the city is the 5 star hotel built just beside the site. the second reason enrique’s post was well timed for me is that last weekend i visited the guggenheim’s frank lloyd wright exhibit, ‘from within outward.’ i had been warned by previous reviews that this was a mostly hagiographical show, but i wanted to see for myself the tribute to the architect that most architects love to dismiss: in other words, you know you are well into architecture school when you get your third or fourth frank lloyd wright monograph/coffee table book/puzzle [or nowadays, lego puzzle!]. 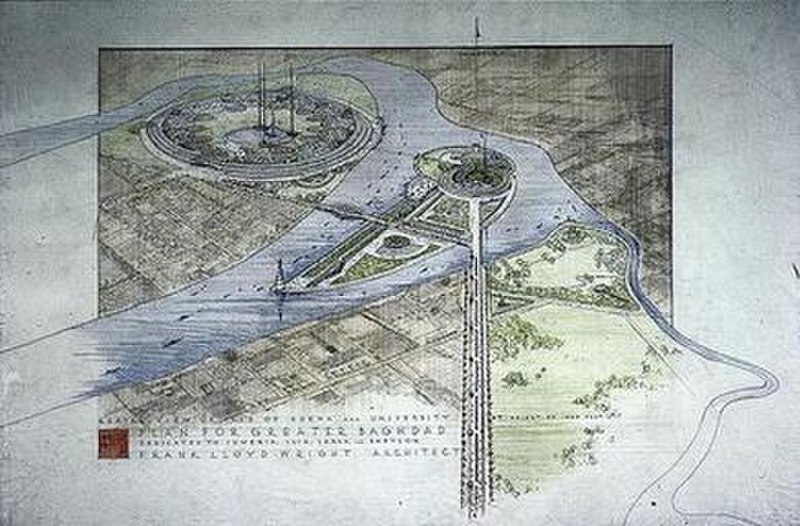 i was familiar with wright’s broadacre city plans, but not with his plans for baghdad from 1957-58. i was surprised at the great similarities between wright’s naive, mega-scaled proposals and the realized plans for new delhi [specifically the administrative center designed by edward lutyens and completed in 1931]. compare also with the scale of the infrastructure development surrounding mashad’s imam reza shrine complex, the new capital complex in astana, and more famously, dubai. wright’s own mile-high skyscraper proposal is a missed opportunity for the exhibition- although it has been noted before, a comparison to the burj dubai would have driven the point home. in fact, the most sensible commentary in the exhibition was the one i overheard from a woman standing beside me. “it’s rather like speer, no?” she said, commenting on one of wright’s thankfully unbuilt, megascaled buildings. it is sad to think that while wright intended his architecture to embody of the united states’ democratic ideals, his ideas on scale, infrastructure and the predominance of one language [his] coincided less with a pluralistic society and more with the dictatorial voice of totalitarianism. in contrast, previous civilizations denote a higher sensibility towards multiple scales and diverse environments in their city plans.